Unique? Check! Animal print? (A Fall 09 trend) Check! Lots of... character? Double check! A collaboration between Jean Charles de Castlebajac (say it 5x fast) and Free-Lance, these shoes (Available at Colette) have all the makings of a fashion classic, or do they? Teeth? Whiskers? A TAIL? Maybe they're more appropriate for Halloween? One thing's for sure, they're worth talking about. What's your take? Haute Couture or Hot Mess? Would/ COULD you wear them? With What? Is there a celebrity you think could pull them off? 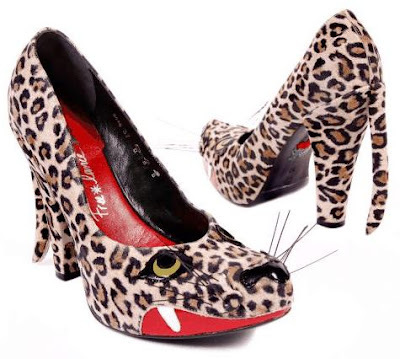 If nothing else, this pair brings new meaning to the word "fierce." Here's to style that doesn't take itself seriously (at all). I'm going to have to pass on these. They are a little TOO out there. They're a bit much for my taste too, but they were so outrageous I just HAD to share lol.